- Updated: 09/03/18 .. see about topic updates. The nation's 382 metro areas (July 2015 CBSA vintage) contained approximately 279.7 million people in 2017, representing approximately 85.9 percent of the nation's 325.7 population. The nation’s 551 micro areas contained approximately 27.7 million people in 2017, representing approximately 8.5 percent of the nation’s population. Use the county interactive table to examine metro by county demographic change 2010-2017, the how and why of change and what these patterns suggest about the future. Use the CBSA/metro interactive table to examine metro demographic change 2010-2017, the how and why of change and what these patterns suggest about the future. ... this report updates frequently. Selected updates are listed below. Register to receive update notifications.  Economic profile and personal income; section 6.1; annual/November.  Census tracts overview section; annual/December.  General Demographics section updated/extended; annual/December.  Gross Domestic Product section; section 6.5; annual/September.  Higher education institutions; annual/February.  Overview lead narrative on population components of change; annual/March.  Metro & county demographic component detailed annual estimates; annual/March.  School districts in metro & K-12 enrollment; annual/August. This section provides a summary of recent business, demographic, economic trends; year-ahead & outlook to 2030. The Recent Trends & Outlook section narrative is updated quarterly and is published in the subscriber edition. The narrative covers topics about this metro such as .. assessing the implications of next jobs report, impact of the Fed's action on the interest rate, which sectors are expanding or contracting, how housing market conditions are changing and more on insights to help your planning and decision-making. Population. 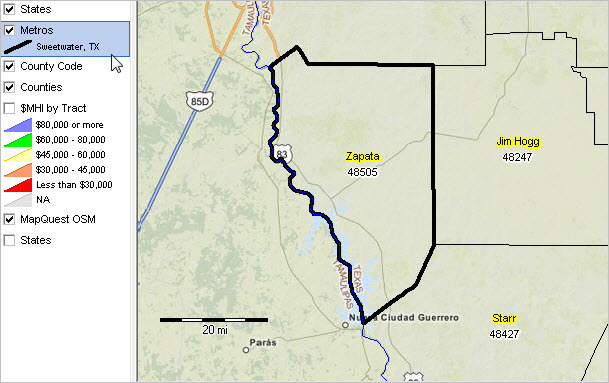 The total population of the Zapata, TX MISA changed from 14,087 in 2010 to 14,322 in 2017, a change of 235 (1.7%). Among all metros, Zapata, TX MISA was ranked number 928 in 2017, based on total population. It ranked 517 based population change from 2010 to 2017 and ranked 418 based population percent change from 2010 to 2017. See section 1. for population projections to 2030 for the metro by county. See section 4. for additional details on population. Geographic Mobility. 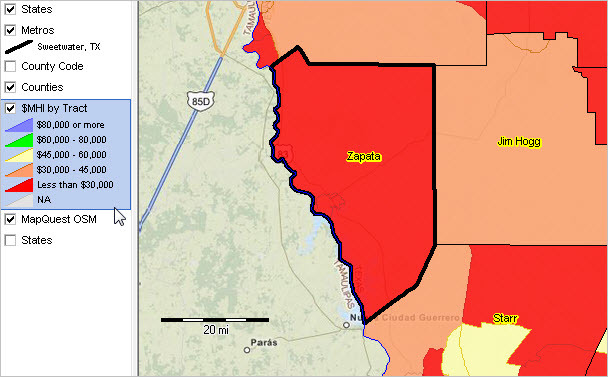 The net migration of the Zapata, TX MISA changed from -100 in 2011 (6/30/10 to 7/1/11) to -282 in 2017. From 2011 through 2017, the total net migration was -1,118; the average annual net migration was -160. See section 4 for additional details on migration. Housing. The total housing stock of the Zapata, TX MISA changed from 6,209 in 2010 to 6,415 in 2017, a change of 206 (3.3%). See section 5 for additional details on housing. Personal Income. The total personal income of Zapata, TX MISA changed from 328,368 ($000s) in 2010 to 347,620 ($000s) in 2016, a change of 19,252 ($000s) (5.9%). The per capita personal income changed from $23,330 in 2010 to $24,226 in 2016, a change of $896 (3.8%). See section 6.1. for additional details on personal income. Employment Situation (updated monthly). The Zapata, TX MISA labor force changed from 4,705 in November 2016 to 4,843 in November 2017, a change of 138 (2.9%). The unemployment rate changed from 10.54% in November 2016 to 6.61% in November 2017, a change of -3.93 (-37.32%). See section 6.7. for additional details on the employment situation. Counties are labeled with county name and state-county FIPS code. View developed with CV XE GIS software. See this section to learn about making custom metro maps. Median household income by census tract (see color/data legend at left of map). Metropolitan areas are defined as one or more contiguous counties/county equivalent areas based on a set of demographic-economic criteria. Counties and county equivalent areas comprising the metro are shown below. For multi-county metros, this section provides insights into how the population is changing by county. Many metros changed geographic composition (counties included in the metro) between the Census 2010 vintage and the current vintage. hese changes, if any, are also shown below (county is marked with **). Click county code link to view county components of change. All counties time series population estimates: 2010-2017 interactive table. This section is not available for this area. Housing unit estimates shown in section 5.1. are model-based estimates developed by the Census Bureau annually. These estimates may differ some from ACS-based estimates shown in section 5.2. The model-based estimates are available in advance of the ACS-based data and developed using a different method. Unlike the ACS-based 1-year estimates, the model-based estimates are available for all counties and metros. See related time series housing estimates interactive table. This section is not available for this area in this version. Based on Census Building Permits (http://proximityone.com/metro_residentialconstruction.htm, these data provide insights into the trending quality, type and value of new residential construction. See web section for footnote and related information. These data are updated monthly. The table presents the most recent 12 months. Based on the FHFA (Fannie Mae/Freddie Mac) Housing Price Index (http://proximityone.com/hpi.htm), these non seasonally adjusted data provide insights into movement of single-family housing prices. The data are updated quarterly and feature a short lag between the date of availability and quarterly reference date. See related interactive table to compare areas. See related 5-Digit ZIP Code HPI interactive table. This table shows annual HPI values for the U.S., CBSA state, CBSA and CBSA component counties for the base year 2000 = 100. The rightmost column shows housing value appreciation between 2010 and 2017. Based on BEA Regional Economic Information System (http://proximityone.com/reis.htm), these data provide a comprehensive overview of the local economy. See web section for footnote and related information. Based on BLS Quarterly Census of Employment and Wages (http://proximityone.com/eee.htm), these data are updated quarterly and feature only a 7 month lag between the date of availability and quarterly reference date. See related interactive table to compare areas. .. cell value of '...' indicates value suppressed to maintain confidentiality. Use the following links to access detailed QCEW data by detailed type of business (CSV files) .. &see notes on using these files. Based on Census County Business Patterns (http://proximityone.com/cbp2016.htm), these place of work data include all sectors except crop/animal production; rail transportation; postal service; pension, health, welfare & vacation funds; trusts, estates & agency accounts; private households; public administration. Most government operations are excluded. See related interactive table. ... this section updates with 2017 data in April 2019. This section is not available in this version for this area. Based on BEA Metro Gross Domestic Products (GDP) estimates (http://proximityone.com/metrogdp.htm), these provide a comprehensive measure of the metro economic output. Gross domestic product (GDP) is the value of the goods and services produced by the metro’s economy less the value of the goods and services used up in production. GDP estimates, updated annually, are available for only Metropolitan Statistical Areas (MSAs). Use the interactive table to rank, sort, compare metros. The Fortune 1000 companies (http://proximityone.com/metros_fortune1000.htm) are the largest businesses in the U.S.
Based on BLS Local Area Unemployment Statistics (http://proximityone.com/laus.htm), these data are updated monthly and feature only a 2 month lag between the date of availability and month reference date. See related annual labor force characteristics in section 6.4. See related interactive table to compare areas. The table shows most recent six months and data (not seasonally adjusted) for month one year earlier than most recent month. A cost of living measure is provided by the Regional Price Parity (RPP) for goods and services for an area (state or MSA). The RPP is developed by the Bureau of Economic Analysis (BEA) and updated annually. The RPP is an index where the national average of the cost of goods and services sold is 100. The RPP is a measure of the cost of living in that area relative to the U.S. overall average. The RPP is available for states and MSAs. The 2006-2016 series will be updated and extended to 2017 in May 2019. More detail is available in subscriber edition. This document is a proprietary resource developed by ProximityOne and is licensed to the subscriber/licensee for their own use. This document may be used in any manner except that it may not be distributed whole or in part. Any use of the document should reference the source as ProximityOne and include a link to the S&O Main Page. There is no warranty of any type associated with any aspect of this report. The user of this document is solely responsible to any use, direct or indirect, that might be made of this document. This document to provides data and informaiton to assess geographic, demographic, economic characteristics and trends for this metro ... and component geographic areas including cities and counties. There are several aspects important to effective use of this document. Accessing and Consuming the Information. The HTML document is designed for use with any browser using a tablet, laptop or desktop. The nature of the material is not intended for optimal use via cellphone. Organization & Navigation. Use the Table of Contents at the top of the document to select a section by hyperlink. Subject matter. Data presented here are derived from many sources. Some subject matter, such as employment, are included from multiple sources. Which are the "best" employment (for example) data to use and why are multi-sourced employment data useful? Interpretation; developing your own narrative. This document may be only the start of your intended use. Create your own narrative for presentations to groups. Add your own data. Add charts and maps. Printing the Document; alternative file structures. The HTML page has built-in, invisible page breaks. Print the document in portrait mode.